Jairaj Singh is a Field Organizer at APANO. He was born and bred in Decatur, Georgia by Punjabi-Sikh immigrant parents. 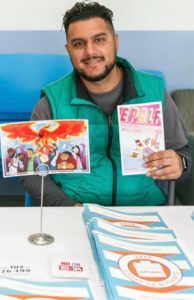 Jairaj received his Bachelor’s degree in Environmental Studies from Emory University and he recently graduated with a Masters degree in Urban and Regional Planning from Portland State University. Jairaj is also a 2016 graduate of OPAL Environmental Justice Oregon’s Organizer-In-Training program, where he learned the science and art of community organizing alongside Portland’s environmental justice and civil rights community. Jairaj is striving to create a stronger community; more inclusive, safe, and healthy urban environments for historically under-served and under-represented communities, by combining his community organizing skills, with his knowledge in geoinformatics, and his passion for urban planning.